OK you like classic cars but are a bit bored by those old mixed tapes. No worries we have you covered. This cassette tape will turn any old car cassette player into a bluetooth streaming device. Just slide in the tape and start streaming that music from your phone. No wires are needed as the bluetooth cassette has a build in batter that charges through USB. And to make things even better the cassette adapter also has a microphone build in so that you can make those hand free phone calls to. 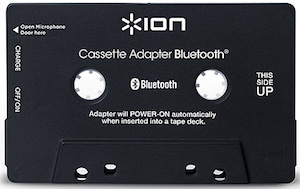 Road trip time in you good old car will be even better if you have this ION Bluetooth Cassette Adapter.